If you find yourself passionate about music production, you’ll need to invest in excellent studio headphones. But with so many popular brands in the market and between the hype and the craze surrounding them, it can get pretty difficult to pick the right studio headphones for yourself. To make things easier, and to take the guesswork out of choosing a great pair of studio headset for yourself, we’ve created the ultimate buyer’s guide on the Best Studio headphones. This list has been created keeping in mind both beginners, who generally run low on budget and professionals who are very specific on what they want. Going forward, we are going to dive into the detailed reviews of these headphones. If you’ve got any suggestions that you believe should be on this list, please do let us know! We value your suggestions very much! When it comes to headphones, Sennheiser is basically the king of the market. Professional, Bluetooth or just day-to-day headphones, you name it, Sennheiser’s got it. The HD600 are open back, audio-mixing focused headphones, landing at slightly higher than mid-range when it comes to cost. Honestly, though, these are still an absolute bargain. These headphones are the ideal choice for users looking for quality open-back headphones and are not restricted by a low budget. The open-back construction makes for smooth, crisp sounds which can be a bit of an issue on closed-back ones, making them perfect for audio engineers looking to produce the best quality of music. Open-back design delivers extremely clear and transparent sound. Built with an aluminum coil, making them extremely lightweight mixing headphones. Oval-shaped over-the-ear ear cups with great comfort quality. Packed with neodymium ferrous magnet system for astounding dynamic response. High-quality open metal-mesh earpiece covers. Detachable, Kevlar-reinforced OFC Wired Cable. The HD600 is an open, dynamic and professional pair of headphones built for audiophiles, offering an accurate view of Sonics, resulting in the emission of Clear sound waves with no external sound disturbance. All these come together, making them a favorite among the topmost sound engineers in the industry. The padding on the headband and ear cups is one of the most comfortable we have never come across in headphones. You can easily wear them throughout the day without discomfort issues. The sound quality is nothing less than amazing. The base is very precise and accurate and the mids are amazing. The detail level in audio is fantastic and will help you create amazing sounding music. We recommend these to anyone who is on the lookout for impeccable quality headphones, as these are absolutely extraordinary when compared to other headphones available in the market. Another plus point is that coming from such a big and popular manufacturer, you also get a 2 years warranty period leading to minimal worry about sale issues. If you’re looking to invest in headphones for a long period of time, these are a great choice. They can end up being a little pricey, especially if you are a beginner but we honestly believe they are completely justified in their cost. 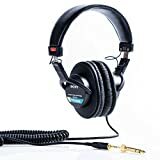 These headphones have an immense number of reviews and ratings all over the internet which can be exceptionally useful in answering any questions you may have. These headphones are absolutely world-class and will 100% make for a remarkable listening experience. Manufactured specifically for studio purposes and packed with world-class features, these headphones will blow your mind. However, if you are on the lookout for closed-back headphones, then read on for the Audio Technica ATH-50X that comes in at 2nd position on this list. High-quality metal mesh grilles deliver extremely clear and transparent sound. Neodymium magnet ensures optimum sensitivity and dynamic response. Extremely Lightweight due to its open-back design. If you’ve got cash to spend and are looking for a great pair of excellent open-back headphones, then nothing is quite going to beat the HD600. These headphones boast literally every feature needed for a solid pair of studio headsets, justifying their position as one of the best headphones for mixing. The sound quality is amazing, the comfort level is excellent, and overall the HD600 absolutely proves itself as a pair of world-class headphones. When it comes to creating powerful headphones Audio Technica comes highly recommended. The ATH-M50X is an absolute gem from Audio Technica, which not only works incredibly in terms of function but also comes with a great build quality, and design. 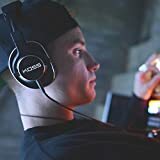 Critically acclaimed by the best music gurus and audio engineers in the industry, these are by far the best closed-back headphones for music production - casual listening too - period! And, they are pretty affordable for beginners who want to have a go at music. Proprietary 45mm Large Drivers intended for a perfect fit. Excellent Sound Clarity and Bass Enhancement. Exceptional Sound Isolation supported by closed-back design. The cable is completely removable. Comes with 3 different cables: 1 meter, 3 meters, and 1 meter coiled. Extremely flexible headband with soft leather padding. Available in four different colors: Black, Grey, Blue, and White. These headphones come in second on our list since they’d be the ideal pick for just about anyone. 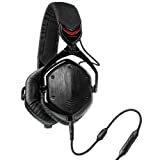 If you are looking for great multi-purpose headphones that you can use both for studio purposed and additionally with other devices, then these work perfectly. The vast majority of studio specific headphones lack bass since they need to keep the frequency flat for better sound engineering, but the manufacturer of these headphones has shown genuine concern regarding this and have included a great bass functionality which can be used as needed. So for somebody low on spending, seeking excellent headphones with bass, these are a great choice! The volume is impeccable and the bass is genuine bass. While far from what you would get in high-end headphones, it is still pretty close to perfect bass. 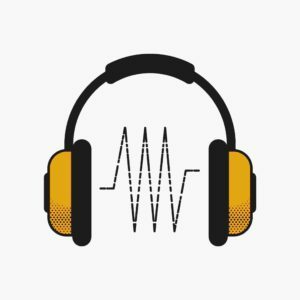 Sound isolation is a pretty neat feature for most headphones to have, specifically for music production. And the sound isolation on these headphones is pretty exceptional and works best when used for studio mixing. For general use, however, you’ll find it does an okay job but use it solely as studio monitor headphones, and it works out extremely well. The design of the headphones is very premium and sturdy. Along with the different sizes of cables, you get a carry bag that matches the colors of the headphones. The cushion padding on the ear cups and the headband is soft and shouldn't cause any issues. The weight of the ATH-M50X comes in at around 9.0 ounces, making it pretty lightweight and comfortable. Perfect sound quality supported by rare-earth magnets under 45mm drivers. Rich Bass and Clear Treble supported by Closed-back technology. Fits in perfectly and is compatible with all type of devices to make audio mixing more convenient for you. Lightweight, and easy enough to carry around all day. Extremely soft and flexible headband and ear cups. You won't get anything such incredible in the mid-spending value tag. Audio Technica has been on the market for quite a while and has a history of amazing headphones with this pair being their masterpiece. Packed with the latest and best technology, these is a great choice for anybody. One of the most basic issues when it comes to monitoring headphones is the overall weight of the headphones. Most headphones used today weigh in at around 800 grams which can cause serious strain issues for people working long hours every day. With the DT 990, however, weight is one less thing to worry about. Coming in at around 230 grams, these headphones are super lightweight and comfortable. Beyerdynamic has shown a serious concern towards the overall weight and has worked intensively on its overall build, and design, which features an open-back. Open-back, over-the-ear design, ideal for studio monitoring. Velour covering on ear cups for extreme comfort. Treble sound and strong bass. Comes with 3m coiled cable. These headphones from Beyerdynamic are pretty great in terms of specifications. In general specifications, these headphones come with an open diffused field and 250-ohm drivers, along with a wired cable. The renowned manufacturer has given its best in terms of sound quality and we managed to get pretty excellent sound reproductions in our testing. On top, you get a rugged, adjustable headband that is both flexible, and durable. The ear cups are the most interesting part of the design. They are open-back headphones with grilled exterior design, build ideally for mixing purpose. The large and super soft ear cups are made of microfiber and are one of the most comfortable pairs of headphones in the market. In the comfort department, the DT 990 pro simply blows its competitors out of the water. These headphones are ideal for music mixers or sound engineers who work for continuous hours in their studio, as the lightweight and comfortable design make it easy to use over a longer period of time. The DT 990 is not much different from the Audio Technica MTH-50X feature-wise with the main difference being in build design, and while the MTH-50X work well for general use, the DT-990 is more focused towards sound engineering and might not be best for use as regular headphones. The price of the headphones comes in at the mid-range and while you can probably find headphones with almost similar features at a comparatively lower price, the DT 900 rules in terms of build and overall weight. Lightweight Diaphragm for extreme impulse performance. High score in terms of comfort and quality. Perfect for lost lasting audio sessions. Mild bass and treble sound for effective sound work. Comes with exposed cables (Not big fans of those). These monitor headphones come packed with intense features at a mid-range price tag, making them a pretty sweet deal for customers. The sound quality is great and the comfort level is insane. We would absolutely recommend these for anyone looking for a great pair of open-back studio headphones. These are the younger siblings of the ATH-M50X and deserve a spot on this list since although they are a slightly older version, they are far from outdated. These headphones sport similar powerful features at a lower price tag making them great for people working on a lower budget! Built with cutting-edge engineering, and robust construction, you get a similar clean design as on its successor. The manufacturers have included 40mm drivers with rare earth magnet and aluminium wire coils as similar to ATH-M50X. 40mm perfect fit drivers with integrated copper-clad aluminium wire coils and rare earth magnet. Two detachable cables included, one being the coiled cable and other being the straight cable. Premium design and build quality. Professional grade headband and cushion quality. 90-degree swiveling earcups for one hand monitoring. Comfortable ear cups and headband. The headphones come with excellent isolation technology, ensuring minimal disturbance from external sounds. Drivers are 90 degrees, swiveling kind, which makes it comfortable to monitor music with just one driver the ear. The headphones are constructed using premium quality material and the headbands and ear cups provide a moderate level of comfort. Even though the MTH-40X is not as heavily padded as the 50X, it is still very comfortable to wear and can surely be worn for a long period of time. The ATH 40X comes with 40 mm drivers which are slightly smaller than the 45mm drivers on the ATH 50X. The driver size affects the base. Now, while this doesn't mean that the base on the 40X is weak, it's just not as good as the 50X. The sound quality in the ATH 40X is as good as the ATH 50X. Mid-range is very accurate and clear with excellent depth. The audio that comes out is detailed and crisp, ideally suited for studio monitoring. As mentioned earlier, these are the predecessor of ATH-M50X but in no way are weaker than it. They would be an ideal choice for people who are low on budget and want to try out Audio Technica headphones. An aspiring musician may not necessarily have an unlimited budget to try out premium accessories and so we would easily recommend the ATH-M40X as a lower cost alternative that comes packed with amazing features and maintains a certain trust factor in terms of brand name. Robust construction for better durability and lifespan. Comfortable leather padding on both headband and ear cups. Clear, balanced and natural sound quality. Easy to afford due to its entry-level price tag. Not bass heavy [Bass is good but is clearly not a priority]. The ATH-MX40 are a great choice for a brand name, closed-back headphones at an entry-level price range. The sound quality is brilliant and the headphones are similar to the very popular Audio Technica ATH-M50X. Though the bass is not perfect, it can still effectively get the job done. These are one of the most durable headphones we have come across. The sound quality is excellent and manages to stay on par with more established brands such as Sony and Sennheiser. V-Moda is known for its unique and hard-core design. The headphones are solid, stylish and above all, are great listening devices. We have been pleasantly surprised with our experience of the build quality on all V-Moda headphones so far. Clean bass and ultra-extended highs. Unique cliqfold design for easy and compact storage. Lightweight headphones with a comfortable headband. Coming from an award-winning manufacturer, the headphones feature 50mm drivers with inner and outer rings separating the bass from bleeding while providing a perfect balance. Having been tested at 6 different frequencies the manufacturers have ensured they work well for every purpose. The headphones are made up of a light material but are quite powerful nonetheless. Packed with Noise Isolation technology, it allows you to focus solely on your music by cutting out surrounding sounds. The overall build quality of these monitor headphones is excellent. They are extremely durable and not prone to wear and tear. The manufacturer claims that it comes with an all steel frame that offers military-level durability. The cushion covering on the ear cups is not the most comfortable and will eventually cause soreness after continuous use of an hour or so. To fix this, we highly recommend you get an XL pair of cushion covering. The best thing about these headphones is their portable nature. It is super compact due to its CLIQFOLD design, making it very easy to carry them anywhere. Along with the headphones, you also get a tiny hard-shell case that will keep your headphones very safe. In terms of sound quality, the M100 delivers in all aspects and produces clear sound and punchy bass. The vocals are very clear and will definitely help with monitoring minor details. The Crossfade M100 is ideal for people looking for durable headphones on a decent budget. Power-packed with premium sound features, in addition to the durability and design factor, these headphones are pretty hard to ignore. Industry standard sound quality with excellent bass effect. Solid steel frame with the best durability in the market. Unique CLIQFOLD design for compact storage makes it easy to carry. The headband is pretty comfortable. Small chord wire restricts the swiveling up to 180 degrees. The cushions that come along are not the most comfortable. If durability is a top concern for you, these headphones would be the ideal choice for its durable build quality and premium features. They have been the top pick for audiophiles and DJs and are great to use for studio purposes. As stated already, when it comes to audio devices, Sennheiser is the best in business. Next, on the list, we’ve got the HD598 CS, a pair of great sounding closed-back headphones. 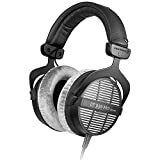 Having reviewed multiple Sennheiser headphones - most with a hefty price tag - we would absolutely recommend these headphones since they are an absolute steal and are suitable for both beginners, and professionals. Padded headband and ear cups for comfortable long sessions of listening. Compatible with stereo component, mobile, tablets, computers etc. Perfect for studio purpose, casual listening, and gaming. Closed-back design reduces ambient noise. These audiophile grade headphones are made of plastic with a smooth and clean finish at the top. What we love most about them though is the branding design. A small branding plate (as shown in the image) looks very sleek and works beautifully with the design of these audiophile headphones. The padding on the headphones don’t feel excessive and the headband and ear cushions end up being very comfortable for both short-term and long-term use. The closed-back design makes for minimal surrounding sounds, making them perfect to focus only on the music. Regardless of whether you use them in the studio as monitor headphones or back at home with your iPhone or laptop, they work seamlessly well with every music device. The headphones come with 3.5 mm jack and 6.3mm jack connectivity options. With 23 OHM independence and a 10 – 28,000 Hz frequency range, you’re pretty set! 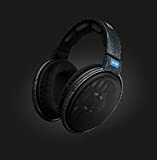 These studio headphones from Sennheiser weighing in at 11 ounces and supported by its compact size, makes it easy and extremely comfortable to use. The headphones are available in only one color: matte black, with a velvety material on the top of both the drivers. The sound quality on the HD598 CS is great, with improved bass and sound isolation. The headphones come packed with E.A.R technology i.e. "Ergonomic Acoustic Refinement". The technology design channels audio directly into the ears providing a more "in-room" like listening experience. Highly comfortable pair of headphones. Outstanding for Jazz and vocals. Noise isolating technology blocks ambient sounds around you. Great Bass reproduction with a closed-back design. Comes with Ergonomic Acoustic Refinement technology. The plastic used on the body is not the best quality. These headphones are a great choice if you’re looking for a closed-back pair of headphones with rolled off extreme highs and elevated mids. Solid Bass, great low profile design, lightweight, and noise isolation technology are just some of the great features packed into these headphones. Anyone dedicated to music production should go for these without a second thought, especially considering the amazing price point they come at! The Sony MDRV6 is one of the most popular and price effective pair of headphones in the professional headphones category. Sony is one of the top manufacturers when it comes to audio devices and these headphones have been a consistent choice of the people for decades. They are ideally built for one purpose: studio monitoring. While we do have more premium high-end headphones on here, we also wanted to offer up a cost-effective option and these are our best bet. Great sound, brilliant comfort, and solid lifespan at really low-cost pricing. 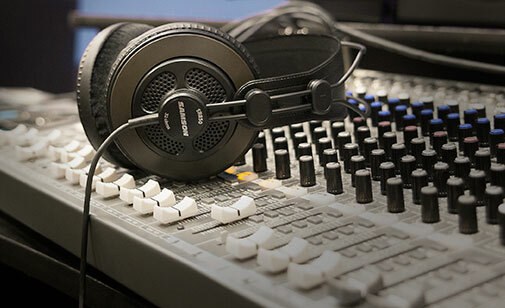 Professional grade headphones ideally build for studio monitoring purpose. 40mm drivers with neodymium magnets. Closed-back over-ear design that acts as a noise cancelation feature. 9.8 feet coiled cord that ends up with 3.5mm jack (comes with 6.5mm external jack). Extremely compact when folded up. Rugged construction with very comfortable leather covering and cushion padding. Extremely high-quality sound reproduction at an awesome price. The headphones come with 40mm drivers and neodymium magnets that emit great quality sound. The headphones also come with a leather headband for great comfort. The over-the-ear drivers cover the ears pretty well, isolating surrounding sounds and allowing you to focus on your work. The closed-back design help in blocking external noise to an extent, helping you hear great, clear sound and excellent bass up to 5 Hz. The headphones are very lightweight, weighing at around 8.1 ounces. Along with the headphones, you get a 10 feet copper cord wire which frees you up and gives you more range of motion. These headphones are perfect for users that rely on renowned brands and have a low budget to work with. At the price range, this is again, the best from Sony when compared to other leading manufacturers. Coming to sound quality, there is absolutely no issue on that front. Frequency response is flat because there is no artificial enhancement from the amp. The sound that you hear is precisely what the artist has put on the recording. Bass is fine, but if you want to improve it, we’d recommend using the headphones with an amplifier, although, even without the amplifier the bass is clear and natural. These headphones are also pretty durable. There are people out there who have been using these for over 10 years now and they still sound the same. They are great for every genre of music with all kinds of music sounding great on them. Powerful and detailed sound reproduction. Neodymium magnets with 40mm large drivers. 10 feet Copper-clad aluminum voice coil wire for better power management. Comes with an incredibly low price tag when compared to its competitors. Built to last for decades. These are certainly great headphones for sound editing and music production and that is ultimately what you need them for. Everything sounds super clear and detailed, plus frequencies register very well. They are also comfortable to wear and can be used for longer periods of time with minimal issues. Overall, they are definitely a great pair of value for money headphones. 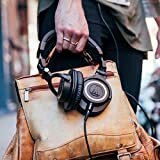 These are the third featured headphones from Audio Technica on our list, with a major difference being the open-back design, allowing for a perfect balance between internal sounds and surrounding sounds. Specially designed for studio monitoring, these are going to be a great match with both your sound needs and budget. The headphones come equipped with 53mm drivers with an open-back design ensuring you feel minimal pressure, resulting in a very natural and comfortable feel. Open-back headphones with zero pressure or strain. Self-adjusting grilled headband with the 3D wing design. Flexible and soft ear pads for extreme comfort. 38 Ohms impedance and frequency ran. When it comes to the Bobbin-CCAW cord coil, the addition makes it extremely easy to handle the power and control it as per your needs. The manufacturers have certainly done a brilliant job on the design, keeping it lightweight at around 9.1 ounces, which feels pretty light on the head. Also, the ear cushions that come with the headphones feel quite comfortable. Two connecting cables of 3.5mm and 6.3mm provide the option to use these headphones not just for studio purposes but also at home with smartphones and other devices. The one negative about these headphones would be the overall size. The drivers are fine, but the headband is where the issue arises. The 3D wings don’t align well with the head, causing the headphones to slip and move around after a while. They can even slip off instantly if you shake your head around. The sound quality, while pleasant, is not entirely perfect. The audio is quite flat and the bass is missing. Overall, though, they are well balanced with perfect mid-tones that bring out the best in vocals and audio layering. We tested them on an amplifier and the results were quite nice. These headphones would be an ideal choice for customers who aren’t ready to invest in higher-end products like the M50X but want to try out a good pair of studio headphones. They come from the same manufacturer, so you’ve got similarities such as great design, build quality, and high-end features but at a lower price tag. Of course, we would have to agree there is a lot of difference between the overall look of both the headphones. These sport a metal grill at the top supported by the headband and open-back large drivers for better ear coverage and a smooth sound experience. Full open-air type with minimal to no pressure on ears. Lightweight aluminum honeycomb body case. Extremely light, weighing in at 283 grams. The 3D wings design don’t align perfectly with the head. Unlike other headphones, the cable is not removable. The price point on these headphones is great, considering its features. If you’re a fan of Audio Technica and are dealing with an entry-level budget, then we’d certainly recommend you check these out. Why aren’t any Beats Headphones on here? Around here, we’re pretty obsessed with Beats, and a roundup of any type of headphones, without the mention of Beats, almost never happens. We did, of course, bring in a pair of Beats headphones to test out for this list, which of course, was one of the best wireless headphones we’ve tested out. However, it just doesn’t fit in with the studio headphones criteria. First, it is wireless, which will ultimately create a problem in emitting flat frequency sounds and the second, it comes with pretty small drivers which will probably result in sound leakage. These headphones are the only wireless headphones on our list and have managed to surprise us with great design, and sound performance. Bluedio is not very popular in the market when it comes to professional headphones, but the great reviews left by customers forced us to take a look at these sound mixing headphones, and we’ve gotta say, we’re pretty surprised. Along with the Bluetooth connectivity, you also get a wired connectivity option for extended listening. Comes with both wireless and wired connectivity. Touch and Drag controls on top of the driver. Two inbuilt EQ patterns: Bass booster and Flat response. 25 hours of insane battery life on wireless usage. Packed with PPS 12 Acoustic technology, you get specially build 12 drivers with a sound cavity that emits excellent and deep bass. The manufacturer has also added S/PDIF transmission into the audio jack which helps in experiencing the HD sound even when wired in with the cable. When it comes to the wireless feature, these monitor headphones use Bluetooth as a connectivity option which allows the user to perform sound editing over laptops without being connected through any wired cable. You get a standard wireless connectivity range of 30 feet and a battery life of 25 hours on a single charge. On the driver itself, you don't get control buttons, instead, you get a new touch and drag feature which helps in controlling music operations by simply dragging your finger above the headphones. In terms of design, Bluedio Victory headphones are a combination of plastic and metal construction and weigh around 15 ounces, which we personally think would be quite heavy for most users. The ear cups are covered with soft foam and premium leather making them very comfortable on the ears and the same goes for the headband as well. The Bluedio Victory pro is best for users performing mixing over laptops as the wireless connectivity makes it easy to use. If, however, you don't particularly care about the wireless feature, we would recommend opting for other brands which are more studio-oriented with the Audio Technica ATH-M50X being a good example. PPS12 Exclusive acoustic technology for wide sound and rich bass. Bluetooth APTX for better battery range and less consumption. Intuitive touch controls, just slide your finger to control the music. Padding on both ear cups and the headband is soft. Weight is almost double any other headphones on our list, which could result in strain issues if used over a period of time. Sharp corners on the folding points can cut you. 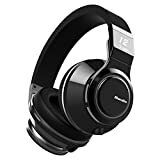 If you’re specifically looking for powerful wireless headphones then these would be a great choice, but if wired headphones are your preference then you’re better off skipping this one entirely considering you get several other wired headphones with the same price tag. The headphones, overall, are great and produce detailed and excellent sound. An important aspect to consider with sound mixing headphones is how well it covers your ears. This is important because headphones that can cover your ears entirely will provide amazing sound isolation, giving you the chance to focus solely on your work. And so if you’ve been looking for bigger studio monitor headphones, then these are for you. From size to comfort to excellent features, combined with an eye-catching price tag, these headphones are pretty perfect for an entry-level user. Koss is a new brand in the market, and owing to great features and design, has made its way onto our list. Professional, fine-tuned studio monitoring headphones. Cord entry available on both left and right driver. The unique D-profile ear cups shape. Koss SLX40 dynamic element (more info below). Built with aluminum, you certainly get a new experience in terms of design and feel. The aluminum might make you think it will land on the heavier side, but surprisingly, it only weighs in at 6.4 ounces, which practically makes it one of the lightest pairs of studio headphones so far. You get a dual cord entry from both sides to the monitor headphones through the unique pass-through feature. Packed with the SLX40 element, it accurately conveys sound in the studio. These headphones have been manufactured keeping in mind their studio use. The headphones emit excellent sound frequency in terms of clarity. These monitor headphones would be a perfect choice for users who are beginning from scratch and are low on budget. The entry-level price tag gives tough competition to popular monitor headphones in the market, with this new brand making its position in the market. The drivers are fairly large with contour sealing cushion that closes gaps around the ear, improving isolation, and provides a better sound experience. If, however, you do not want or need the large drivers, then again, we would recommend you check out the Audio Technica ATH-M50X which has secured the first position on our list. Contour Sealing Cushion for better isolation and bass effect. Koss SLX40 Dynamic Element for precise tuning. Midrange sound is a bit subdued compared to other listening transducers. These headphones are pretty perfect when considered as an entry-level professional pair of headphones, but it does lack higher-end features needed by users engaged in more professional music production. And so, as mentioned, these are good for someone who is just starting out since these come packed with all the basic features that studio headphones should come with. When going for professional headphones you should be pretty sure on which ones to choose and if you don't know about the core features a monitor headphones must carry, then there are chances that you may get caught into a bad deal. Choosing the type of headphones from the perfect brand, we are going to guide you through every step. 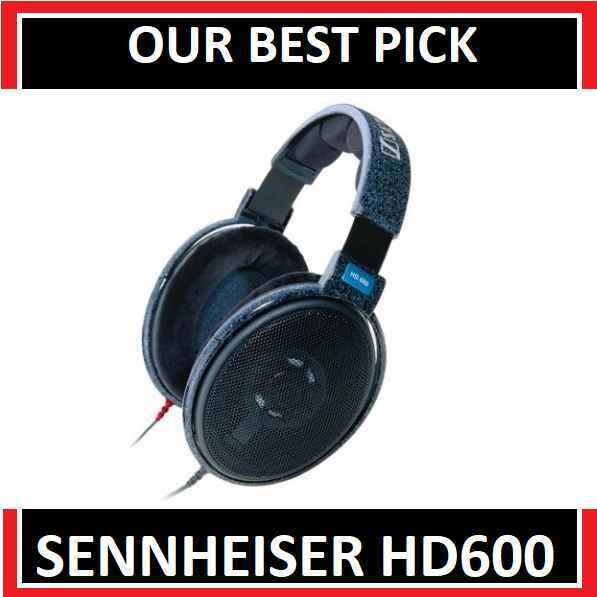 We hope you have already read the reviews for top headphones we mentioned above and have shortlisted few of them to finalize. Large Diaphragm– It helps in noise isolation which keeps your focus on the music without getting interrupted by surroundings. Frequency response: The frequency response is an important factor when considering headphones. A wider frequency response is useful for studio purpose. Decent studio headphone with a higher frequency can provide some big and accurate bass production. Light Weight– Weight should be close to 10 ounces, moreover, if you are buying them or multi-purpose like using with smartphones in spare time then the headphones should be of pretty lightweight. Durability– This is a point which is not addressed by most of the reviewers. The durability is important if you are going to use them for several years, which we are sure you will do as they don’t come with cheap price tags. Back in time when over-ear headphones were pushed into the market, users don't actually care about the various types of headphones available and then with further knowledge users started getting aware with Open back and Closed Back headphones and they are not just different for the sake of names but are completely different in their design and provide different user experience as well. 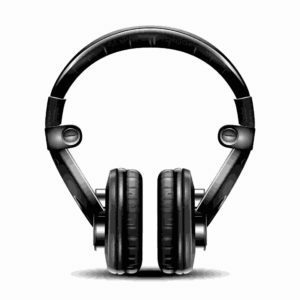 We have reviewed number of headphones both in the criteria of open and closed, moreover, we have also been asked quite a few times by the customers about where to invest their lump of money, because when it comes to buying headphones you have to actually know what the different types of headphones are. Open Back headphones are designed with open back surface perforated in some fashion with horizontal cuts on top while the closed-back headphones have a solid surface of the back which prevents the passing of any sound waves from inside to outside. Talking about the coverings, ear cups of both the headphones cover the ears well only difference is that the one has a lot of opening at the back while the other comes with the complete solid surface. Now the question that arises from hereby is that How the design of these headphones affects the User experience? You may think those horizontal cuts or that solid closed surface don't make up any difference but in reality, they do completely change the game of sound quality you get to hear from them. So now let's have a brief look at the benefits and drawback of these two designs. Closed-back headphones are excellent at isolating noises, but here what need to address is that active or passive noise cancellation features are completely different than the isolation. Though most of the closed back headphones do come with the noise cancellation features but that is just because of the solid back structure which doesn't allow the external surroundings to enter, the bulgy ear cups with an insulated shell of plastic covers the ears very well. By default, most of the closed headphones are designed to provide 10db of noise cancellation. So the moment to turn on the music through your headphones that feature comes into the business and helps in providing you a soothing experience. The closed back headphones perform a wonderful job there when you want to completely focus on your music, they remove the noises from the surrounding to an extent and bring just the music waves to your ears. This comes to very helpful features when you are in a crowded room or traffic area and want to focus on music or have sound engineering products to complete out. The other most common problem with the other headphones is audio leaking which leads to disturbance to the people sitting around you and we must say that the closed headphones are extremely helpful when you are looking to avoid a situation like that, Lets say you are sitting in a library and don't want to disturb the other mates sitting around that's where the closed back headphones will perform a great job for you. The closed back headphones helps in isolation the outside noises as well as reflecting the internal music waves to a better experience, while in open back headphones the air and sound pass freely through an opening in the headphones cups. The benefit of using the open-backed headphones is that you get in the world experience as compared to in the head experience from closed back headphones. For those who have been using in-ear earphones or closed back headphones would have never been worried about the leaking of sound, but since open-backed headphones are designed on purpose, the surrounding noises seems like adding a flavor to the sound, plus when you are in studio the headphones will make you feel like as you are being surrounded by the musicians playing the instruments all around you. The main disadvantage of these studio monitor headphones is that you may unknowingly bother other people around you by the sound coming out of the open design but again if you are buying them for sound engineering purpose then they will end up being a great choice. The most common question put up by newbies and it’s quite normal to own a thing which fulfills multiple purposes and when you are low on a budget it is very important to think like this. The answer to this can vary from one headphone to other, we have summed up the meaning of studio headphones in a definition and we would say that- Studio headphones are designed in a way to emit the flat frequency range so that the sound engineer can hear all frequency details and have a better control over it, there is a big difference between flat and fun and that’s where most of the headphones lack in. To Consider wireless studio headphones or not ? If you check out the market, there are barely any wireless studio monitor headphones. In our list, we have added just one the wireless mixing headphones which use Bluetooth as connectivity options. The reason is that there is the difference between frequencies when you are using it in wired mode and then in wireless mode. If you own a normal wireless headphone you should try them once with the wired mode or if you have already done you would have experienced a change in frequency of music, since we need a flat frequency for music production, so we can’t use any of the wireless ones.